When he moved to Eugene in 1984, Ruby Larson lived in his car for five months, picked berries and fruit, and made wine in the back seat. "I've been brewing since I was 16," says Larson, who distributes beer and wine-making supplies, dba Ruby Brew, out of his auto repair shop, Avant Carb. Ruby's Real Root Beer is a favorite at the Get Fried Rice booth at the Oregon Country Fair. "One of the founders asked me to help," Larson says. "I started running the booth in '89." Get Fried Rice runs on 100 percent volunteer labor and donates all proceeds to non-profit groups chosen by booth workers. Larsen also takes GFR on tour to nine or 10 summer events from California to Washington. A leader in recycling at the fair, GFR will serve all its entrees this year in reusable plastic bowls. "We feed the people who volunteer to wash dishes," Larson notes. "The response is amazing." A graduate of the Master Recyclers program, Larson has initiated several local recycling projects. 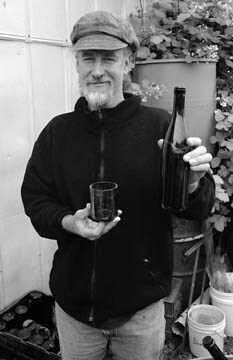 "I've been making drinking glasses out of wine bottles," he demonstrates. "I'll distribute these when I get polishing equipment."